dance.net - Michelle Lewis Dress (10243146) - Read article: Ballet, Jazz, Modern, Hip Hop, Tap, Irish, Disco, Twirling, Cheer: Photos, Chat, Games, Jobs, Events! Beautiful championship dress made by Michelle Lewis. 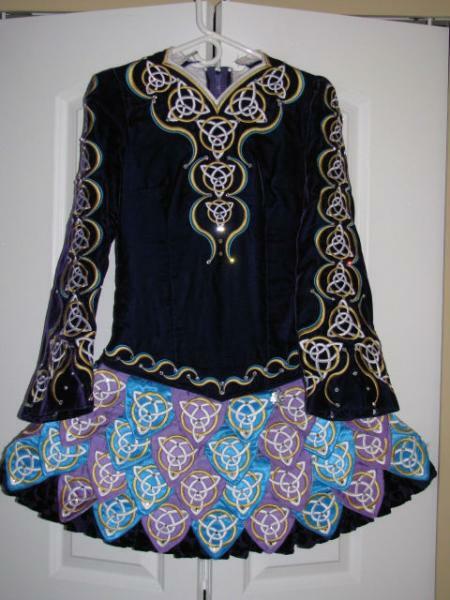 The bodice is a dark velvet purple with a blue and purple petal skirt. The bottom dark purple crushed velvet ruffle can be easily removed or let down. The skirt is lined with purple plaid and comes with matching bloomers and a sparkly headband. There is 2 inches of room on both sides of the bodice to let out and room to let down the skirt. Asking $800 CAD . More pictures available.